The European Region of Gastronomy Platform gathered to celebrate the opening of Sibiu, European Regions of Gastronomy 2019. They share the title this year with the South Aegean and both regions have kick-started a thrilling yearly programme full of events, projects and initiatives aimed at promoting local gastronomy and culture. Hosted on 12 February 2019 by Nicolae Bălcescu Land Forces Academy of Sibiu, the event was organised as a hand-over ceremony during which Galway-West of Ireland and North Brabant, European Regions of Gastronomy awarded 2018 officially passed the baton to 2019 regions. The ceremony involved representatives from IGCAT and the awarded European Regions of Gastronomy, and took place in the framework of the 16th European Region of Gastronomy Platform meeting. 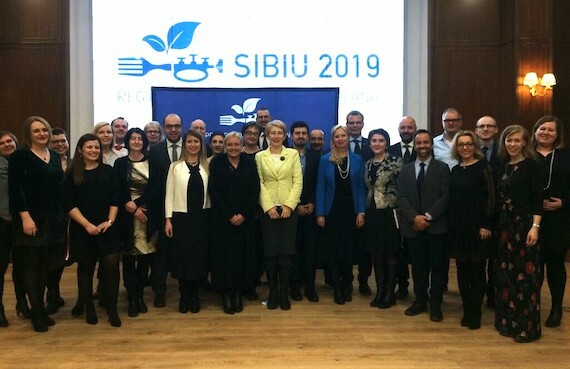 The audience was addressed by representatives of the leading stakeholder group of Sibiu, European Region of Gastronomy 2019, including the Municipality of Sibiu, the Municipality of Mediaș, Sibiu County Council, Lucian Blaga University and the Chamber of Commerce, Industry and Agriculture of Sibiu. All of them recognised the significance of the title as a means to create strong, long-term synergies between different sectors and actors in the territory, as well as to promote local gastronomy while educating local communities towards healthier lifestyles. President of Sibiu County Council, Daniela Cîmpean welcomed the Award as a great opportunity for the region to boost sustainable development and reach higher standards of living by bringing together tradition and modernity. President of IGCAT, Dr. Diane Dodd intervened to congratulate Sibiu for the work they are carrying out as European Region of Gastronomy. She highlighted the importance of celebrating regional gastronomic and cultural traditions through innovation and creativity focused on food and cultural identity, as well as the vital role that the title plays in building local sustainable economies. The ceremony concluded with a military salute performed by the students of the military academy, followed by an open-air banquet prepared by Sibiu European Region of Gastronomy ambassador chefs during which attendees had the chance to taste Sibiu’s gastronomy and its colourful tastes.